This non-commercial website is provided as a free service in good faith to publish as much useful information about the area as possible for the benefit of visitors and residents alike. Permission has been sought for all of the links and I gratefully acknowledge the acceptances received. The site contains information, maps, links to businesses & other information that may be interesting to anyone who enjoys this beautiful part of the country. It is under continuous development, (especially the maps and photos). The Photo Slide Gallery consists of over 250 digital Broads images arranged as slides, which can be clicked to view the full size image. The majority of the photos were taken by myself using a variety of digital cameras, (any images that I didn't take myself are accredited with the photographer's name.) The image resolution has been downsized to reduce loading times over the internet, but still contain high levels of detail. They average 800x600 pixels, the originals being around 2400x1800 pixels. Please feel free to copy and use any of the images (that were taken by me), for non-commercial purposes, but if published on the web, please give this site a mention ! The Map Pages enable a Virtual Tour of the whole of the Broads area. Each map contains 'hotspots' which show 'popup text' when the mouse is over them, and then show either the photograph taken at that point, or open the web link to that company or organisation, when clicked. The database driven Links page contains information on many companies, services, organisations and clubs of interest to Broads users. You can search and list entries by type or keyword, and each entry contains contact information and links to their website (if they have one). If any of the information is incorrect, please let me know via my email link. The Tide Calculator page shows the actual state of the tide at the main locations within the Broads System. It initially displays in real time, but you can select any date and time from 2003 to a couple of years ahead. 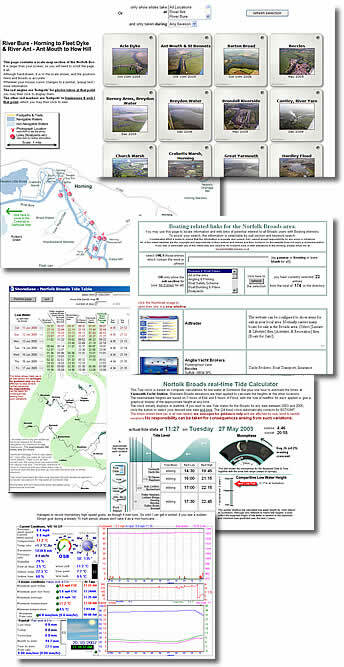 There is also a tide table viewer/printer function, for any start date for 2 to 60 days, with or without the graphic 'tide bands' map. The Weather Page displays real time data from my local weather station, collected from the River Ant, near Ludham Bridge. It is updated every 10 minutes, 24/7. The Broads Puzzle page contains photo puzzles to test your local knowledge and observation skills.